On a cold, windy Saturday we took the MARC train to Baltimore for a bit of an adventure. Unbeknownst to us, we went on the day of the Army-Navy football game. But unlike approximately 90% of the people on the train, we weren’t headed for the football stadium once we arrived in Baltimore. No, we were headed to R. House, a stadium for people who love good food. 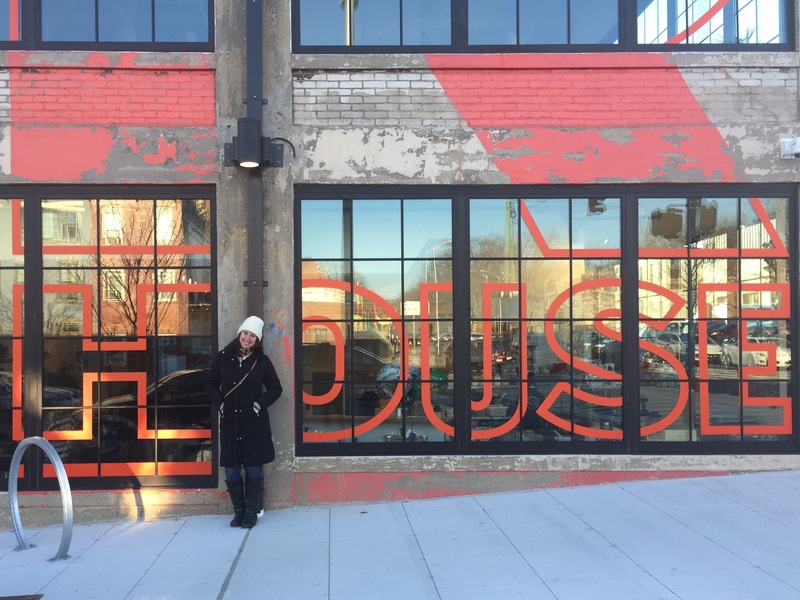 R. House is a brand new food hall located in the Remington neighborhood, a rapidly changing neighborhood north of Penn Station and on the western edge of Charles Village and Johns Hopkins University. The building is a former car showroom, with large windows and garage doors for warmer weather. Inside, the layout is similar to a mall food court, with 11 stalls and a large amount of seating in the middle. 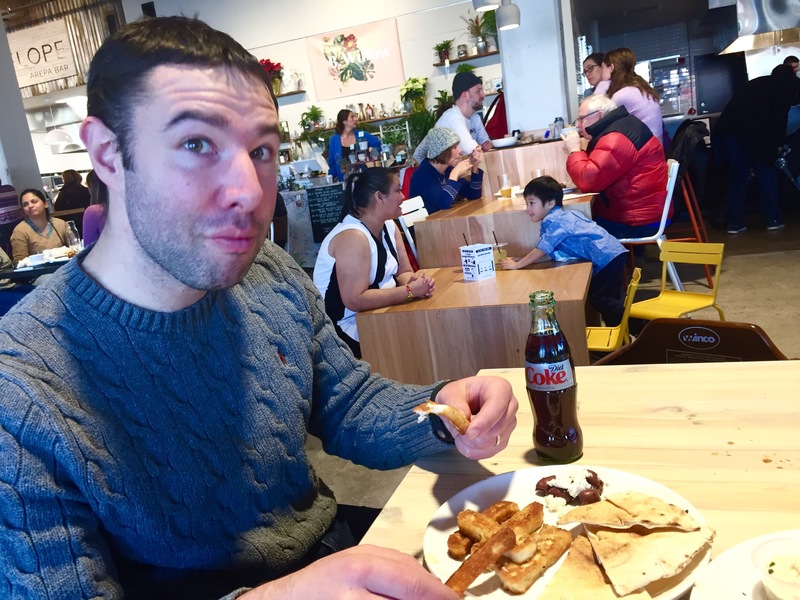 We knew that we wanted arepas, so we started out at White Envelope. White Envelope is named after the cornmeal pocket that serves as the vehicle for their many different filling combinations. The Vegano, which I ordered, come with a reddish-pink bun, made that color by the beets incorporated in the dough. It’s then filled with Venezuelan falafel, spicy butternut squash puree and purslane. The squash puree was the best part, as it added moisture and sweetness. Marnay tried El Cerdo Ilustrado, “The Literate Pig.” Folded inside of the cornmeal pocket was shredded roast pork leg with tomato, arugula and lime mayo. Marnay said that this arepa compared favorably to some of her favorite tacos. She also said that it would not be the same without the lime mayo, and I agree. 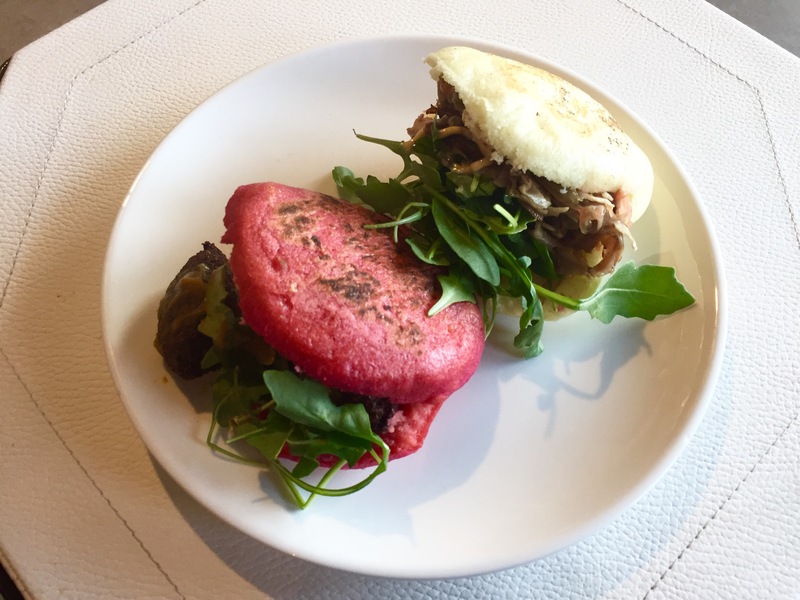 While there are similarities between arepas and tacos, the thick cornmeal bun of arepas screams for some sort of moisture. While we were seated on a long communal bench eating our arepas, something amazing happened. A server from R. Bar, R. House’s centrally located bar, gave us a drink menu and then took our order on an iPad. The roving server thing was the most groundbreaking part of R. House, for me. I could have easily had five glasses of the Apple Milk Punch, with brandy, apple cider, lime and cinnamon syrup. Meanwhile, Marnay’s gin-and Campari-based Lady Remington had a little too much Campari to be a balanced drink. 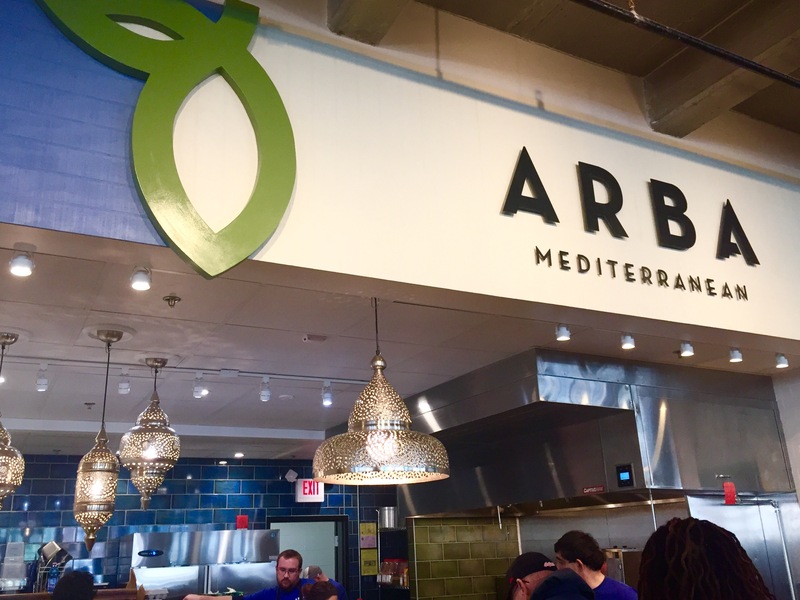 Still quite hungry, we checked out Arba, an Israeli/Palestinian street food stall. Arba means “four” in both Arabic and Hebrew. The Syrian Cheese, which is pan-seared halloumi, was our best bite at Arba and my favorite bite of the day. The pan-sear gave it a pleasant crisp and the cheese was buttery but mild. We also got crispy breaded eggplant, a good snack. Unfortunately, we had just had Peter Chang’s dry-fried eggplant the night before, and no we eggplant fries can compare to Peter Chang’s. BLK Sugar is a bakery from a local Baltimore artisan and Little Baby’s is an ice cream shop based in the Kensington neighborhood of Northeast Philadelphia, which has slowly been expanding outside of that city. Together, they joined forces at R. House to open BLK Sugar/Little Baby’s. 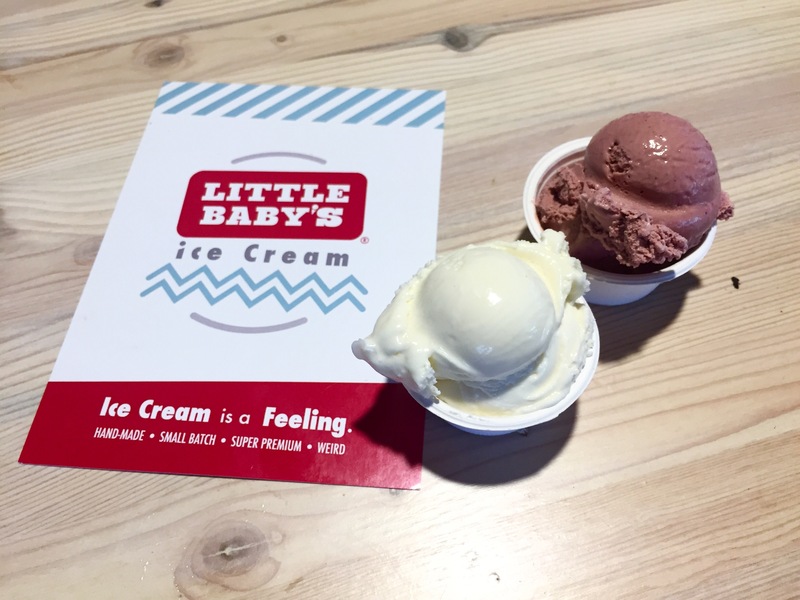 Little Baby’s serves Philadelphia style ice cream, which does not contain eggs. Since we only had ice cream at this stall, we are not going to address BLK Sugar. After all we had eaten, we still wanted something sweet, which is what drew us to Little Baby’s. Marnay got non-dairy Birch Beer, which tasted so much like a birch beer float, it was uncanny. I got Philadelphia style “plain”, which was a perfectly good vanilla ice cream. I returned to R. House on Tuesday morning so that I could have a breakfast experience. 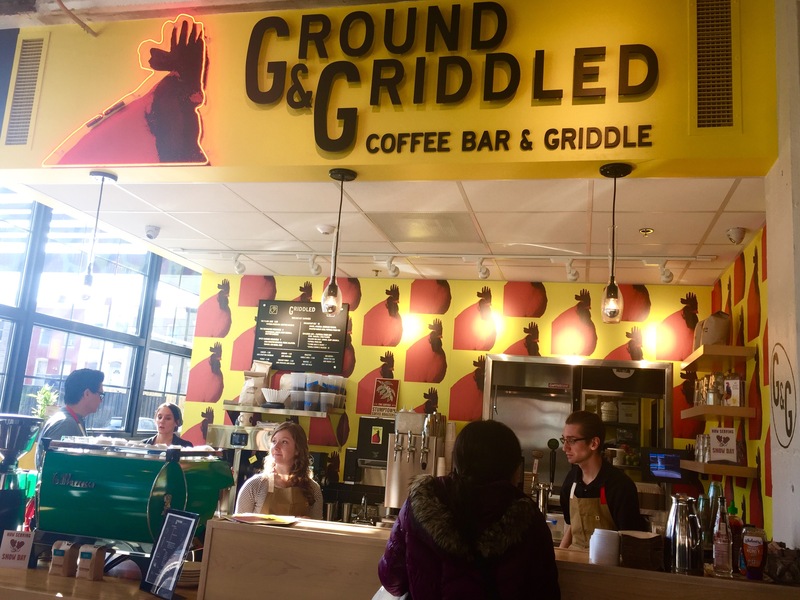 Ground & Griddled, which serves Stumptown coffee and casual breakfast fare, is the most photogenic stall at R. House, with its bright yellow exterior. The place is run by Dave Sherman, the proprietor of Café Cito in Hampden. 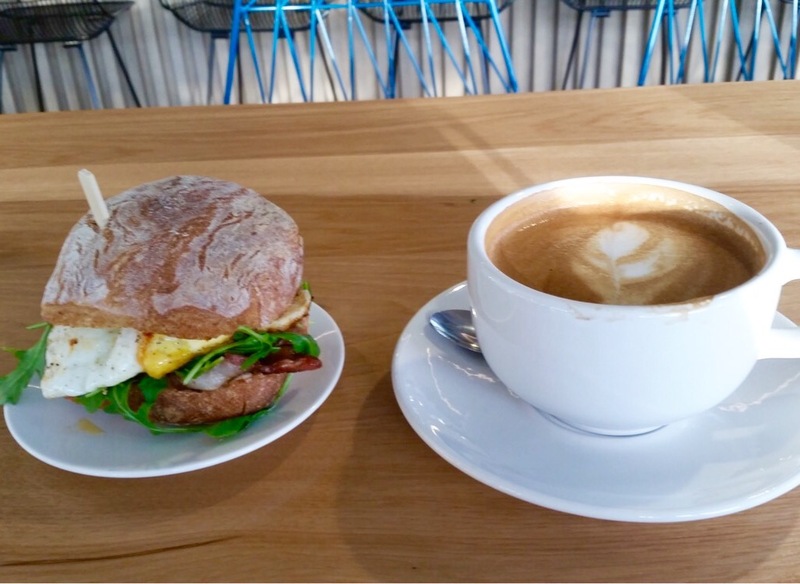 I went with a latte made with housemade nut milk and the Breakfast BLT. The Breakfast BLT, a culinary work of art, is the ideal breakfast to eat while hanging around R. House on a weekday morning. Two slices of ciabatta support the heft of a paprika fried egg, griddled tomatoes, arugula and garlic aioli. The yolk is runny, but not too runny because the ciabatta soaked up much of it. In fact, the sandwich kept its structural integrity quite well thanks to the ciabatta. By the time I got to the end of the sandwich, I only had a few bites of bread left, which tasted like garlic bread thanks to the aioli. There wasn’t any on the sandwich, but I tasted the vinegary heat of Tabasco, most likely because of the paprika. I ate my breakfast at a long communal high-top table and watched the sights and sounds of R. House. I saw prep cooks getting ready for the lunch rush at Amano Taco. I saw the chef from White Envelope walk in the door and talk to Dave Sherman. 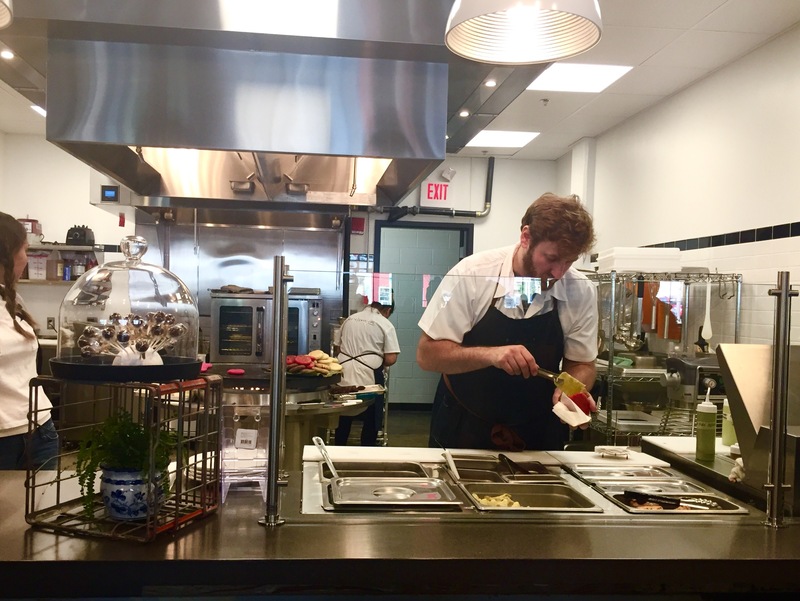 If all goes well, this could be a launching pad for some of Baltimore’s next great chefs. Bob’s Shanghai 66 is located in a strip mall just off Rockville Pike, near the Rockville metro station. It has been in Washingtonian’s Best Cheap Eats for many years, so I was very excited to finally get to try it. When we walked inside from the cold at 8pm on a Friday, the dinner rush was just about ending. We were greeted by a genial host who brought us to our table. Upon being seated, we were served complementary tea. The menu at Bob’s is long, but it helps to go in knowing that they specialize in soup dumplings, also known as XLB. You will want to make sure soup dumplings are part of your meal at Bob’s. We took our own advice on the soup dumplings and also ordered lamb with cumin, sautéed snow pea tips (leaves) and dry noodles with pork. It takes practice to eat the dumplings, because they are twice the size of normal dumplings. They are also filled with very hot broth, so putting the whole thing in your mouth and biting it is out of the question. My suggestion is to gently pierce the top and have a spoon nearby, ready to scoop up the rich, gelatinous, porcine broth. The surprise hit of the night was the snow pea tips. Next time we sauté greens at home, this is how I want them to taste. The preparation is simply snow pea leaves cooked in flavored cooking oils. Even when our table was crowded with food, this was the dish we kept coming back to. Also a surprise was that, at $16.95, they were the most expensive dish of the night. Both ma and la of “mala” were present in the lamb with cumin. 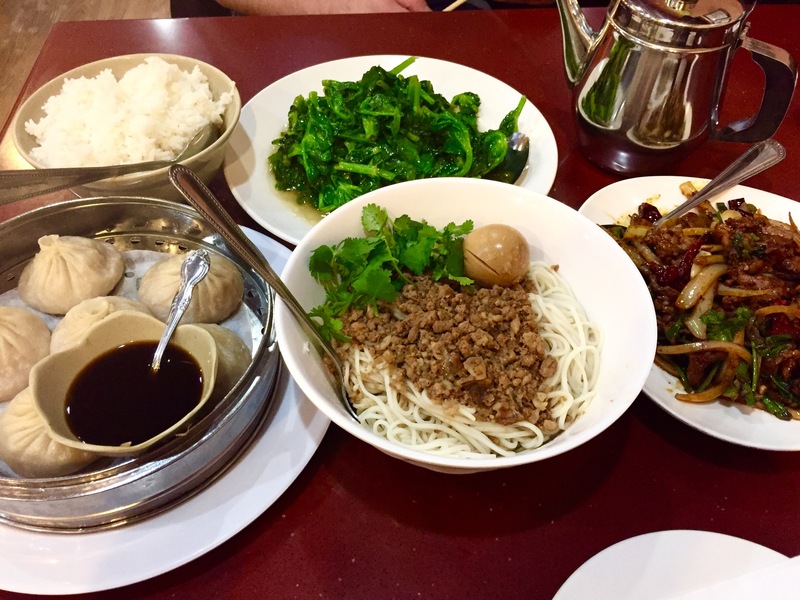 I had heard of mala before and knew that it had something to do with Sichuan peppercorns, but I did not know the exact translation until a read a review by the New York Times’ Ligaya Mishan of a restaurant named Sichuan Dry Pot. She explained that “ma” means tingling and “la” refers to heat. The lamb was not quite as spicy as similar dishes at Peter Chang, but it was full of flavor. I happily ate the leftovers for lunch on Monday. The dry noodles with ground pork, on the other hand, were unremarkable. They were not bad, but it isn’t something I would order again. As we finished our meal, the kitchen staff sat down at a spot near us to enjoy a tableful of their hard work. 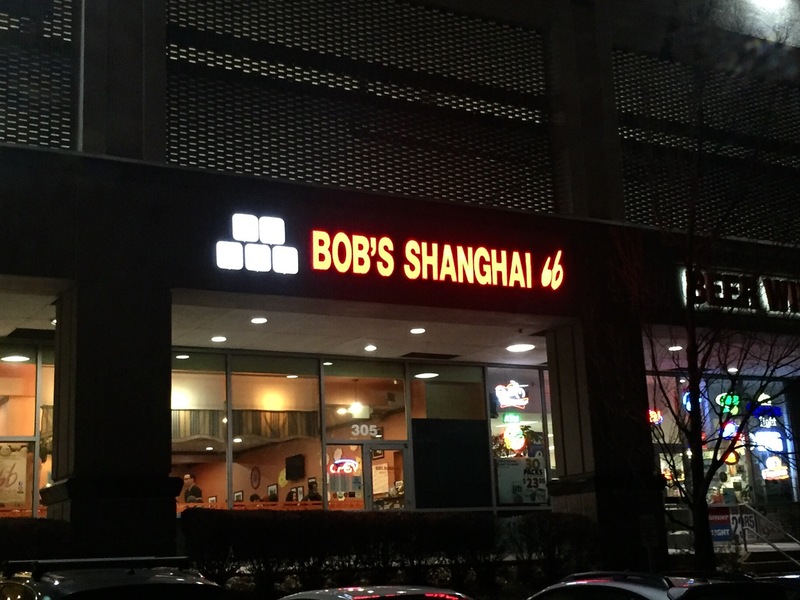 Bob’s Shanghai 66 is a good deal in a metro-accessible location in Rockville. We will be back. We were in the Philadelphia area visiting family for Thanksgiving, and since we needed a break from the traditional Thanksgiving turkey and assorted sides, we took advantage by having dinner at Serpico. Serpico, from James Beard Award-winning chef Peter Serpico and acclaimed restauranteur Stephen Starr, is located on a gritty two block stretch of South Street. Inside however, the space is full of handsome dark woods and has a completely open kitchen, full of buzzing cooks. 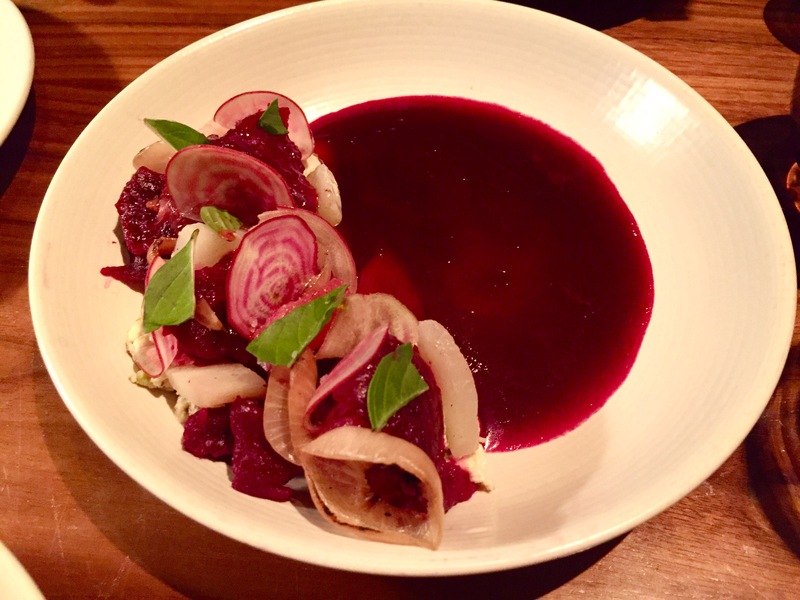 If you have been reading this blog, you may know that we are big fans of the Philadelphia dining scene. In fact, the Monday before our trip, I received in the mail Craig Le Ban’s Ultimate Dining Guide which I read cover to cover in anticipation. Craig Le Ban, by the way, is the widely respected long-time Philadelphia Inquirer food critic and I was excited to check out another one of his favorites. It also gave us a chance to have a meal with my Mom and Grandmother, neither whom we had seen in some time. 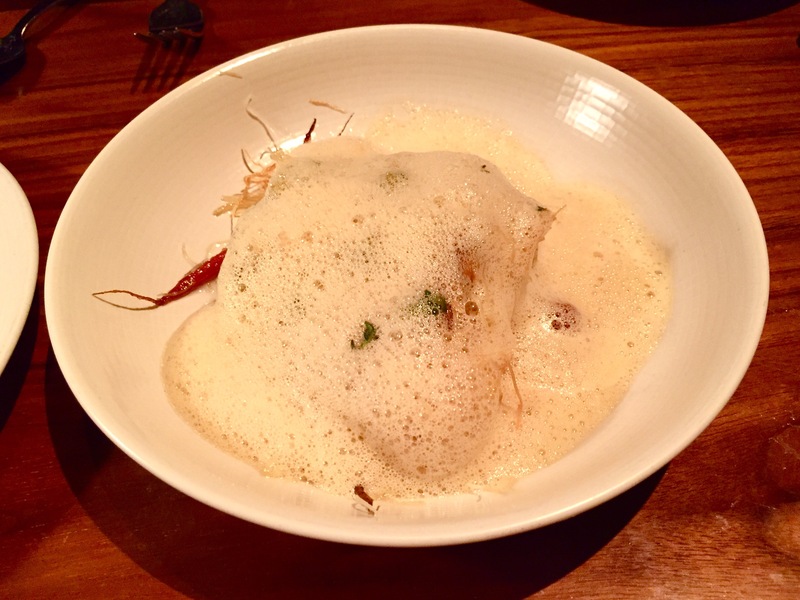 Confit carrot in butter foam with crispy phyllo, ginger sauce and thyme is a stunner. You will want to cut a slice of tender root vegetable and scoop up as much foam as possible, the experience bringing back memories of buttered popcorn at the movies. 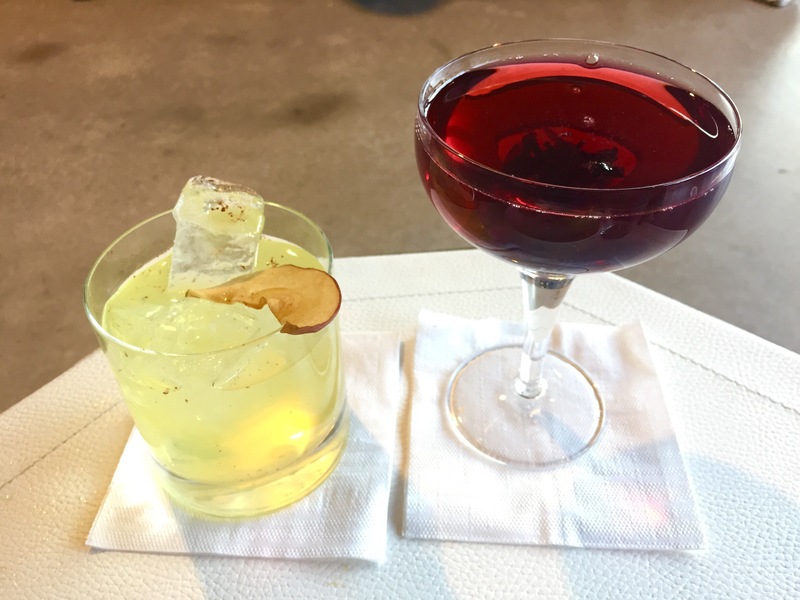 Expertly crafted cocktails include a classic white negroni as well as walnut-infused mezcal with manzanilla sherry, smoked maple and mole bitters. A beet and goat cheese salad with pistachio, kohlrabi and thai basil showcases winter’s fruits and vegetables and is a beauty of a presentation, the best of the night. After these two dishes, though, it would have been nice to get new plates. I understand that restaurants do not have unlimited resources but this is a high-end restaurant and I didn’t want to eat the rest of my meal on a blood orange stained plate. 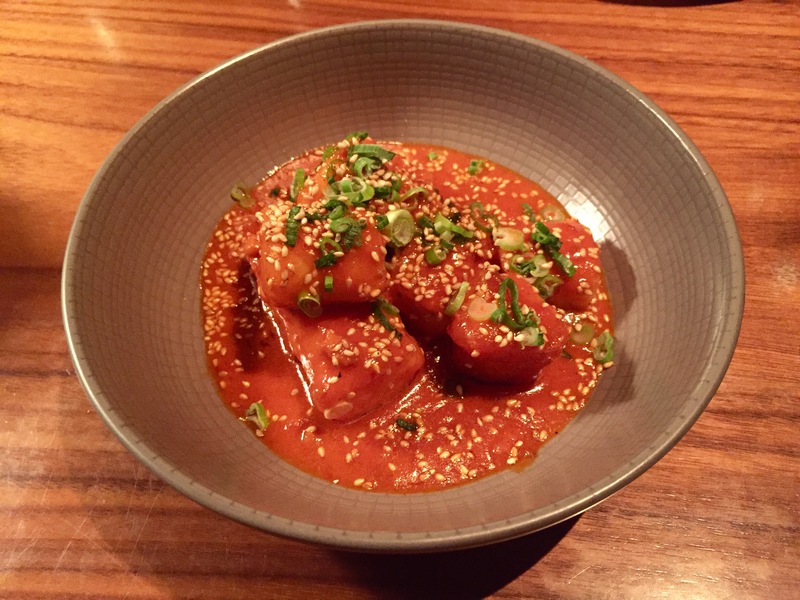 Spicy rice cakes, accurately described by the server as being similar to gnocchi, are enveloped in a sauce of XO, gochujang, white sesame and scallion. The texture from the rice flour makes the cakes gummy and chewy and we enjoyed every bite. The sauce was a huge hit at our table—my grandmother actually scooped up spoonfuls of sauce long after the rice cakes were gone. The slow poached halibut with charred cabbage, pistachios and raisins gets its “skin” from a light breading and a quick detour to the frying pan, the real skin having been removed. 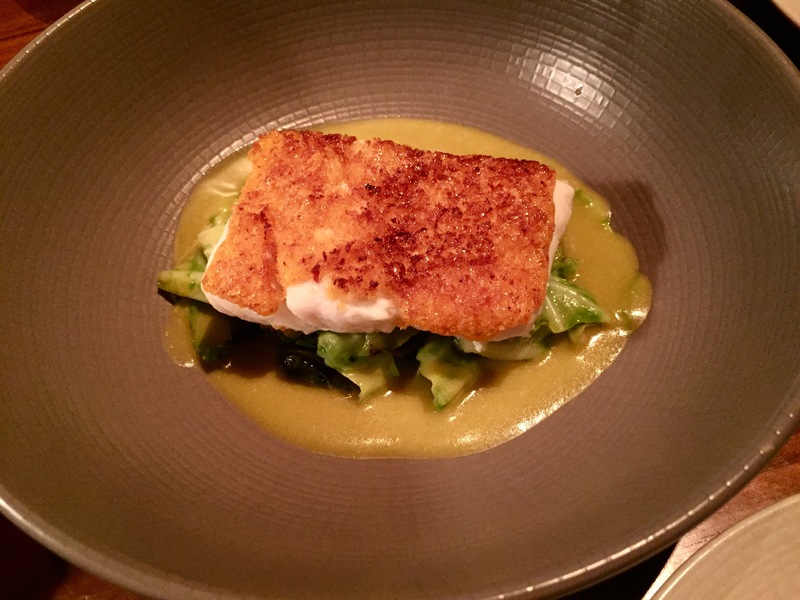 Olives can sometimes be overpowering, but the green olive sauce shows that the kitchen understands this and correctly gives them a supporting role to the halibut. 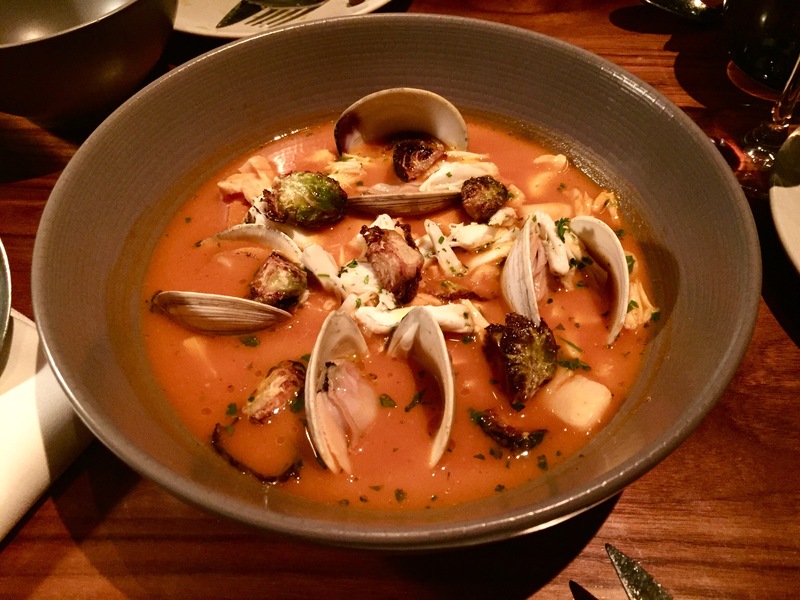 A seafood stew with mussels, scallops, charred brussels sprouts and butternut squash in a tomato dashi has pleasantly chewy clams and squid and showcases more of winter’s harvest. But at a restaurant where food is meant to be shared, it would have made sense to give everyone bowls instead of plates for the broth. Eating soup from a bowl was futile and I just gave up trying to enjoy the broth. We finished the meal with tender slices of short rib in a glaze of whole grain mustard with grilled broccoli and fried potatoes. I did not think much of this dish initially, but in the last few days since our meal I’ve had the taste and texture of the short rib on my mind. It’s actually become the second most memorable dish of the meal, after the spicy rice cakes. 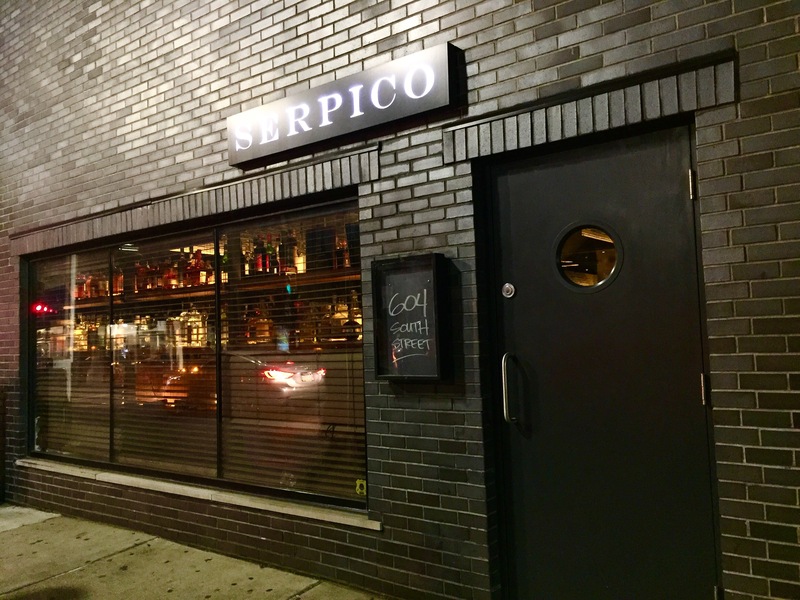 If you can get past the location, and really, it is not that bad…Serpico is well worth a trip. And if you enjoy good food, get the spicy rice cakes.